1. Preheat the grill. Arrange the sliced aubergine and onion in a single layer on the grill pan and brush with a little olive oil. Grill for 3–4minutes until golden, then turn and brush with more oil and grill until golden. 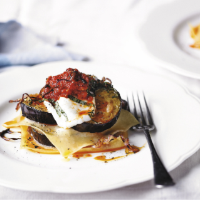 While the aubergine is grilling, cook the lasagne sheets in a pan of boiling water for 4–5 minutes until tender. Drain, cut each sheet in half and toss with the remaining oil. 2. Preheat the oven to 200°C, gas mark 6. Arrange 4 squares of lasagne on an oiled baking sheet then top with half the cooked aubergine and onion, sliced mozzarella, and a teaspoonful of the pesto, seasoning each layer as you go. Top with the other squares of lasagne at an angle to the first, and top with the remaining vegetables, mozzarella and pesto, finishing with the pesto. 3. Scatter with the shredded basil and cook in the oven for 10 minutes until the cheese is melting and piping hot. Transfer to warmed serving plates and drizzle with the extra virgin olive oil. Serve with a green leafy salad.